Nivea claims that the Daily Essentials Gentle Cleansing Cream Wash is enriched with natural Almond Oil & Hydra IQ: Gently cleanses and removes daily impurities, soothes and moisturises the skin to its mild formula that contains Almond Oil suitable for dry and sensitive skin. 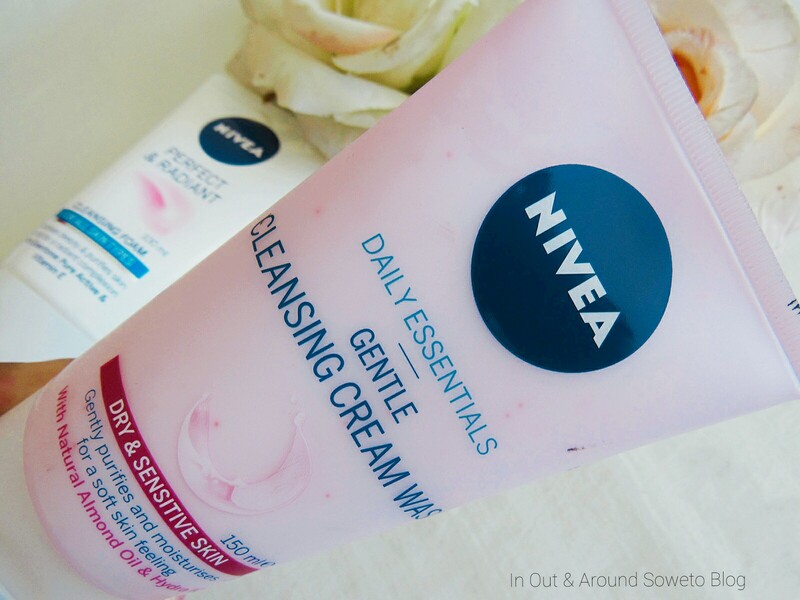 The Nivea Daily Essentials Gentle Cleansing Cream Wash comes in a beautiful blush pink tube and the face wash itself is creamy white and contains some pink hints of what could be the Hydra IQ cause you know how big Nivea is with their IQ/Q10 ingredients. I love face washes that are dedicated to dry and sensitive skin cause I know that I will be getting the best of both worlds as my face will be washed but I won't get that harsh dry feeling afterwards that some face wash products leave behind. Because the Daily Essentials Gentle Cleansing Cream Wash is targeted for us, people with dry skin I feel like it contains a lot of Glycerin and when left on the skin for longer period of time (cause you maybe checking your phone, or answering an email) when you wash it out I feel like a lot of the glycerin is left behind but that's just me. But when used properly as in applying gently to a wet face and neck , massaging in small upward circles and then rinsing it off then yeap the face wash will leave your face washed and still feeling moisturised. The Nivea Daily Essentials Gentle Cleansing Cream Wash for Dry & Sensitive skin works for me as it does not leave my skin looking ashy after using it, this one most definitely needs you to use a toner afterwards so that the glycerin in it does not clog up your pores.